Make your first anthropomorphic Neuroprosthetic, in which you control a robotic claw with the signal of your muscles. In the following experiment you will learn to control the Claw with the EMG signal of your muscles. The Claw will open and close depending on the strength of the signal you make when contracting the muscles of your hand; you can perform this experiment to impress your friends, for a school science fair, or just to dive into the study of Neuroprosthetics! Based on a prototype written by José Enrique López Pérez, student of Electronic Engineering in Oaxaca, Mexico. To make robots people often use servomotors. They are popularly called "servos" and are useful for their small size, low power consumption, and high accuracy. 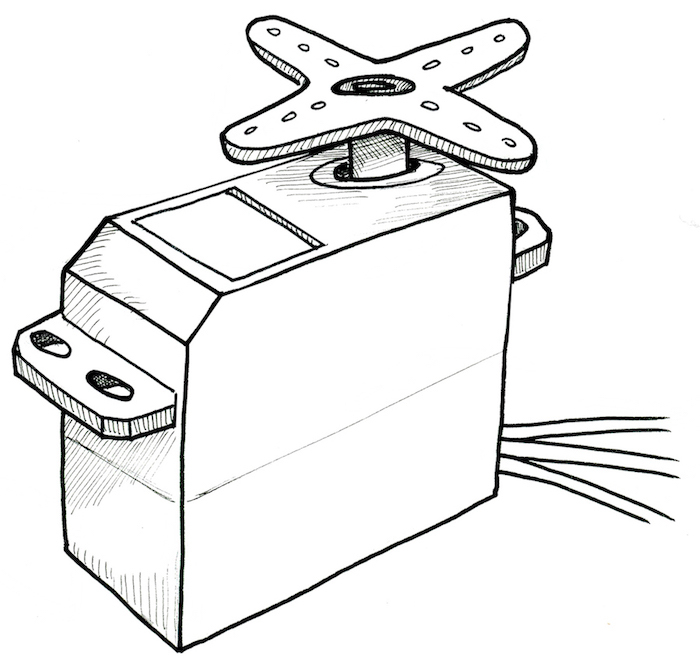 They can be found in the steering control of a toy car or at the helm of a ship or aircraft, for example... A servo motor is made up of a small DC motor, a gear transmission which reduces speed and increases strength, and a small circuit control that makes it possible to move the motor accurately. What is the difference between a stepper motor and a servo motor? Inside a stepper motor there are coils and it's necessary to apply a series of pulses to them for the motor to rotate a certain number of steps; This is why it has so many wires coming out of it (usually 5 to 6 wires). However, inside the servo motor there is one DC motor and a circuit control which enables precise positioning of this motor using only three wires, one for control and the other two for power and ground. Some significant differences between a servomotor and a stepper motor are: speed, strength, and accuracy; the servomotor can move with a velocity greater than a stepper motor, and with more strength and accuracy. A stepper motor is normally not used in high speed applications because at these speeds it loses strength. However, at low speeds the Stepper motor is more accurate and stronger than the servo, that's why it's widely used in industrial robot arms. The PWM (Pulse Width Modulation) is the most commonly used system for servo control. This system generates a square wave which changes the amount of time the pulse is high, keeping the same period; a high level duration of the signal indicates the position where we want to put the motor shaft. An integrated potentiometer in the control circuitry monitors the current angle of the servo: if the axis is at a right angle, then the motor is off. The circuit checks that if the angle is not correct, the servo will correct the direction until the angle is right. Normally, the axis of the servo is able to reach around 180 degrees, but in some servos it reaches 210 degrees (you can even find motors of 360ï¿½, these servos are ideal for installations where you need a wide angle rotation), but this range varies by application and manufacturer. The pulse duration indicates the rotation angle of the motor. It's important to emphasize that, to make a servo remain in the same position, it is necessary to continuously send a pulse of constant width. This way, if there's a force that tries to change this position, the motor will try to resist. If the servo motor stops sending pulses, or the interval between pulses is greater than the maximum allowed, then the servomotor lose strength and stops trying to maintain its position, and any external force will be able to move it. Servo control. 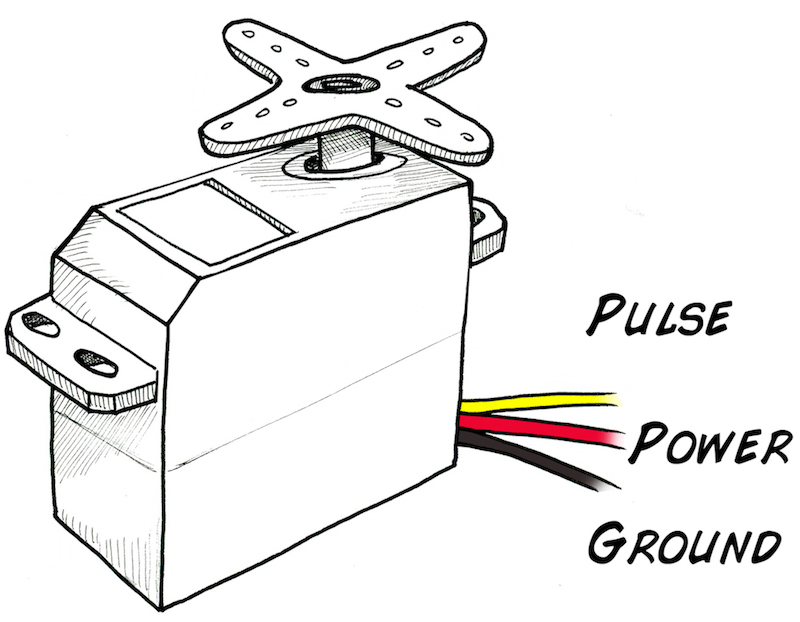 A servomotor traditionally has three wires: power, ground, and signal. The power cable is usually red, and in this configuration is connected to 5V. The ground wire is usually black or brown and must be connected to....ground. The signal cable is usually white, yellow, or orange and needs to be connected to the PWM (Pulse Width Modulation) signal. 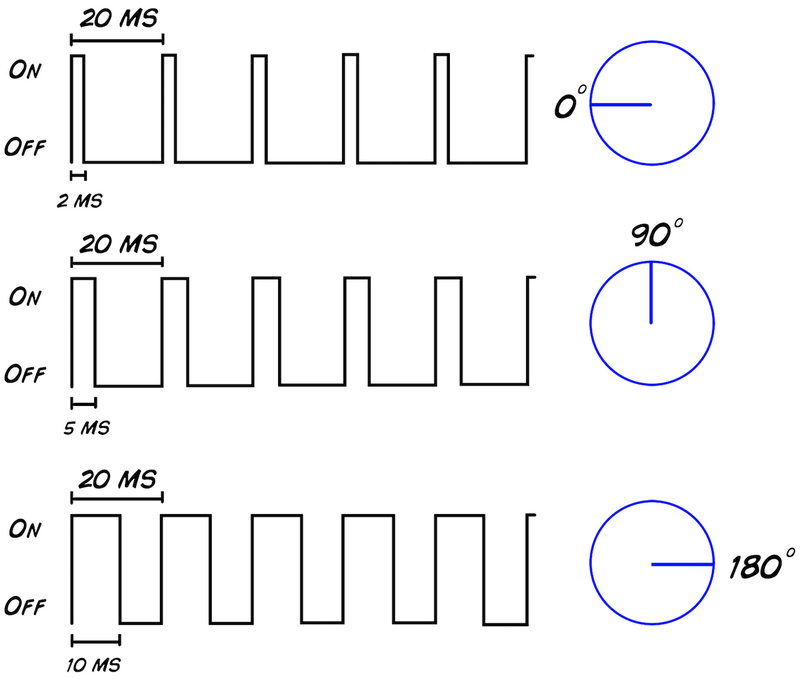 For generating a PWM waveform a microcontroller is often used, because it has specific hardware to perform this task and facilitates the process of generating the signal. It can do this with just a few lines of code. In this experiment you will use only use power, ground, and digital out pin 2 of the SpikerShield to generate a PWM wave. Power will come from a second 9V battery (if you use the Arduino's own power supply to power the motor, amplification of your muscle activity becomes unstable due to the voltage draws of the servo). Your Robotic Claw has a three wire servomotor cable that you plug into your Muscle SpikerShield. The Cable has a black, red, and a yellow wire. The yellow is the control wire, red is power (9V), and black is ground. Plug the Servomotor cable into the three pin header on your Muscle SpikerShield. Order is important! The yellow side goes toward the center of the board. Your Claw is power hungry and needs its own power supply. 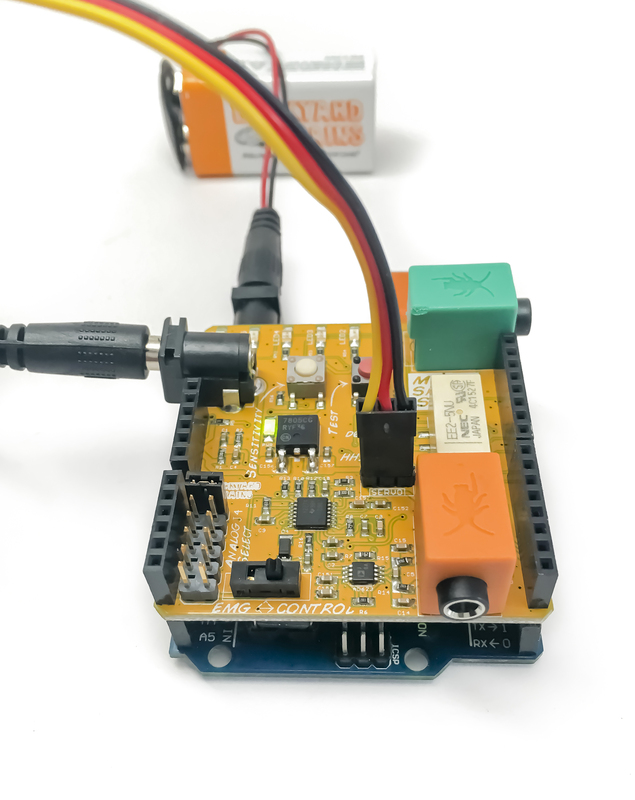 Plug the two 9V batteries into the barrel connectors on the Muscle SpikerShield Board and the Arduino. Place three sticker electrodes on your own, two on your forearm and one on the back of your palm. Taking your orange electrode cable, connect the two red alligator clips on the electrodes on your forearm (order does not matter) and the black alligator clip on the ground on the back of your hand. Plug the orange cable into the orange port on your Muscle SpikerShield. Plug the additional battery into the barrel connector on the blue Arduino board to power up the system. Now flex your arm! You should see the Claw move as well. You can push the white button to change between high and low threshold modes, and you can push the red button to switch between default open or default closing. Code description: This code makes the Arduino, with help of the Muscle SpikerShield, capture EMG signals produced by contracting muscles of the forearm and converts them to PWM pulses to give movement to the servo motor. These pulses change according to the movement of the muscles: the more strength you use to close your hand, the more the Claw closes. Using the library included in this program you can control servo motors easily without much code. Below you can see the code, but if you want to download it, just click here or in the links above. 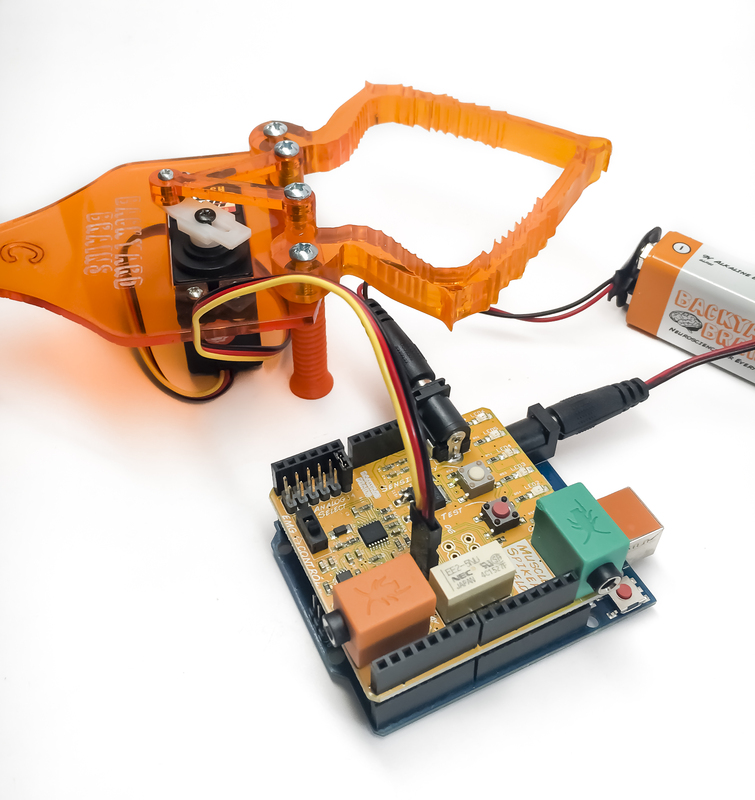 * robotic gripper by controlling servo motor. With this new experience, now you can make your own inventions. Tell us what you are making info@backyardbrains.com and maybe we can start a friendship! Try to design some reaction time experiments that could be done with your own body and with the Claw. How does the time differ? Does it depend on the sensory stimulus you're reacting to? Hook up people of differing levels of athleticism-does this affect the strength of the Claw? How about how long they can the grip? What are some other devices you could connect this to? What might be the limit to what or how many you could connect to?